Hans Tammen works with a wide collection of mechanical devices on his "endangered" guitars, and uses an interactive software of his own design to rework his sounds in realtime. His music has been described as a journey through the land of unending sonic operations, his playing as reverse engineering of the guitar. His music is documented on over a dozen CDs, on labels like Nur/Nicht/Nur, Leo Records, Potlatch, Cadence, or Hybrid. 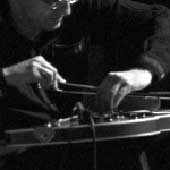 Besides his current trio “Shadow Puppies” with Nick Didkovsky (guitar) and Kurt Ralske (video) his ensembles are often located partly in the US and in Europe, e.g. his east/west German collaboration with dancer Fine Kwiatkowski, the “Extended Guitars” quartet (in the last version with Erhard Hirt, Nick Didkovsky and Keith Rowe), the trio “mechanique[s]” with Martin Speicher (bassclarinet) and Dafna Naphtali (voice & live sound processing), or the trio with Ricardo Arias (balloons) and Günter Müller (electronics).